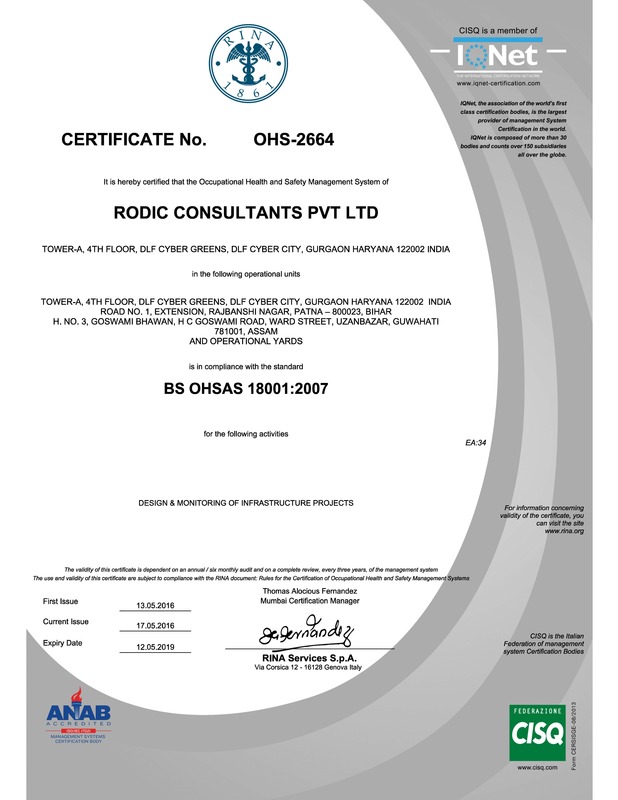 Over the years, Rodic Consultants Private Limited has earned an array of awards and recognitions that bear testimony to the company’s pursuit of operational and managerial excellence. 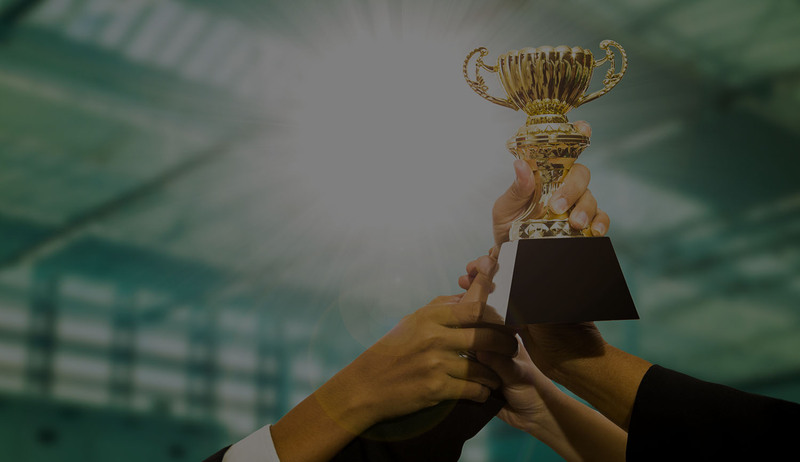 We feel honored to be repeatedly recognized for our cost effective service capabilities, management philosophy, employee engagement policies and innovation.Here are some of the awards, honours and recognition that Rodic Consultants has received. 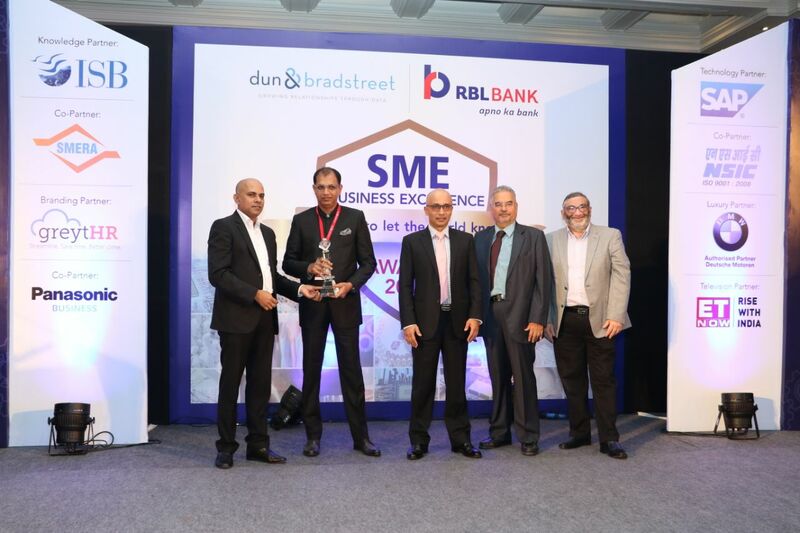 RODIC Consultants Private Limited has been awarded with prestigious SME Business Excellence Award 2017 in Mid – Corporate Segment by Dun & Bradstreet – RBL Bank for exemplary performance in Professional and Business Services sector. Dun & Bradstreet (NYSE:DNB), is world’s leading knowledge provider for past 176 years with a global presence in 190 countries. In India, Dun & Bradstreet has been acknowledging contributions made by Indian entrepreneurs to country’s economic progress through SME Business Excellence Awards since 2008. Our Chairman & Managing Director, Mr. Raj Kumar was felicitated at a grand function on November 17, 2017 held at Hyatt Regency, New Delhi. CMD dedicated this award to the relentless effort and contribution made by each & every member of RODIC family through the years. The ‘CIDC Vishwakarma Awards’ are inspired by the spirit of construction and creation patronized by Lord Vishwakarma, the ruling deity of construction practices in India. Each year, this event is hosted in March by CIDC, the apex body that’s dedicated to work relentlessly towards promoting best practices within the Indian Construction Industry. At the Annual ‘CIDC Vishwakarma Awards’, the work and achievements of individuals and organizations are recognized and applauded. These awards are an embodiment of encouraging truly successful efforts that have made a mark on the industry in terms of delivering better outputs & processes and creating higher benchmarks for the industry to help in nation building. The ‘CIDC Vishwakarma Awards’ are fast becoming an epitome for motivating individuals and organizations to raise their performance in their specific domains leading to significant contribution towards the growth & development of the Indian Construction Industry. 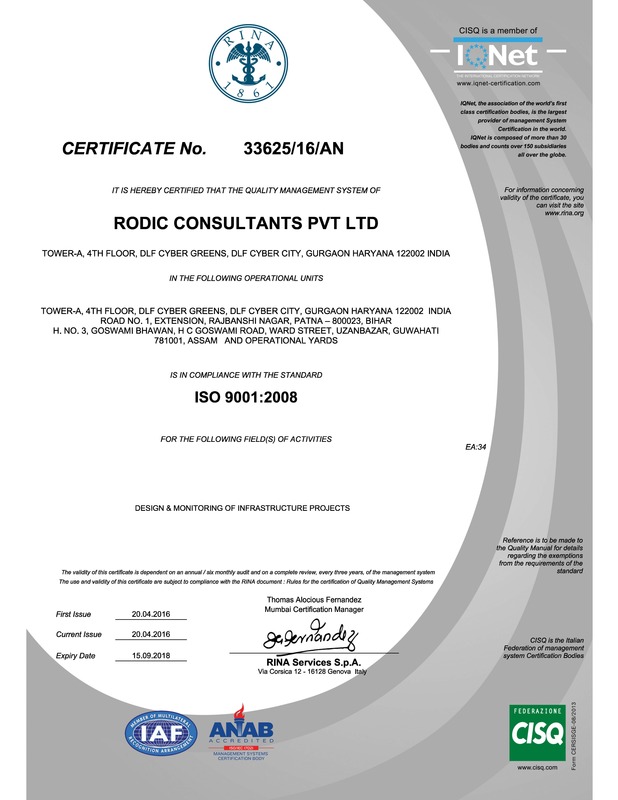 TRACE has successfully completed a TRACEcertification due diligence review of Rodic Consultants Private Limited. 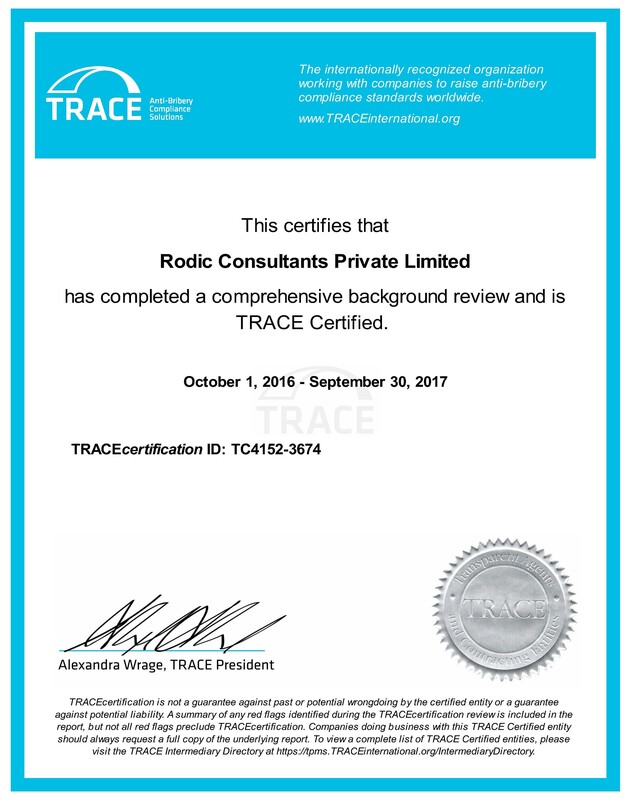 TRACE has issued Rodic Consultants Private Limited a certificate signifying that the company has completed internationally accepted due diligence procedures and has been forthcoming and cooperative during the review process. 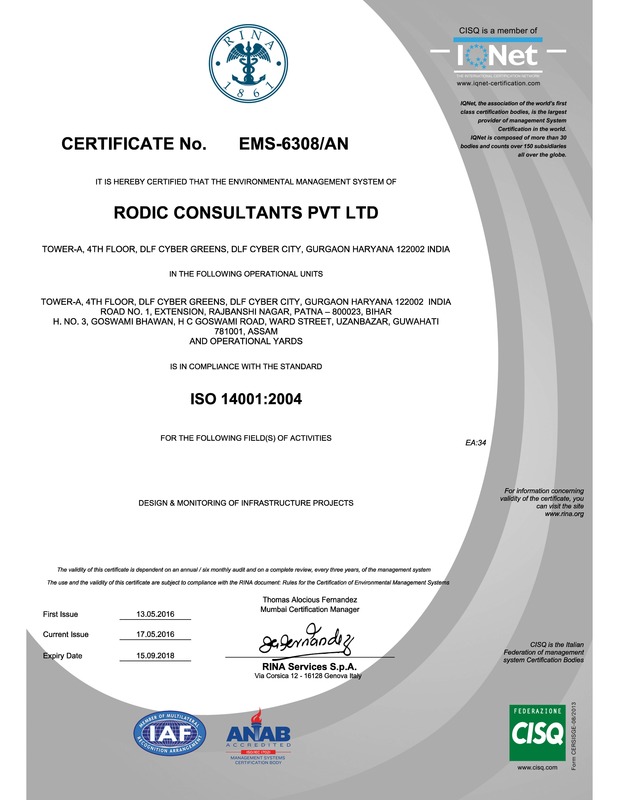 TRACEcertificationunderscores RODIC CONSULTANTS PRIVATE LIMITED’s commitment to transparency in international commercial transactions. 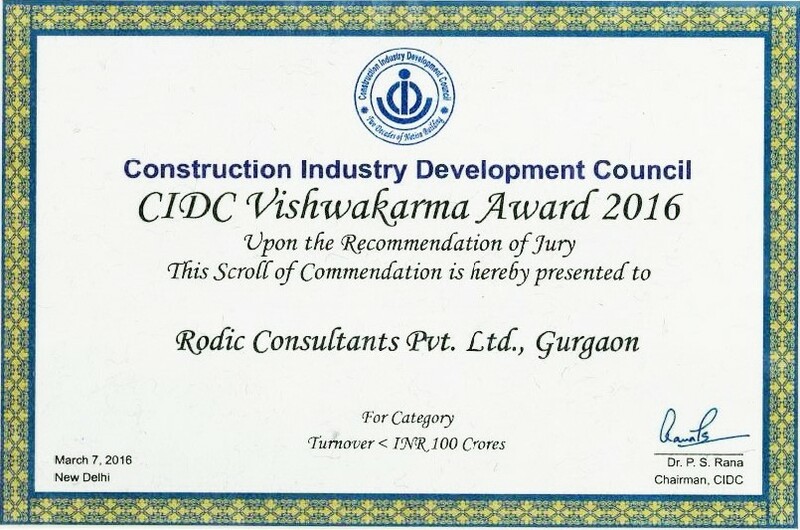 Rodic Consultants has been recognized and awarded the “Achiever’s Award” for its excellent performance and cost-effective approach towards early milestone achievement for the project “Construction of Elevated Corridor from AIIMS (On NH—98) to Digha on Ganga Path (11.90 Km) in the State of Bihar on EPC Basis”. 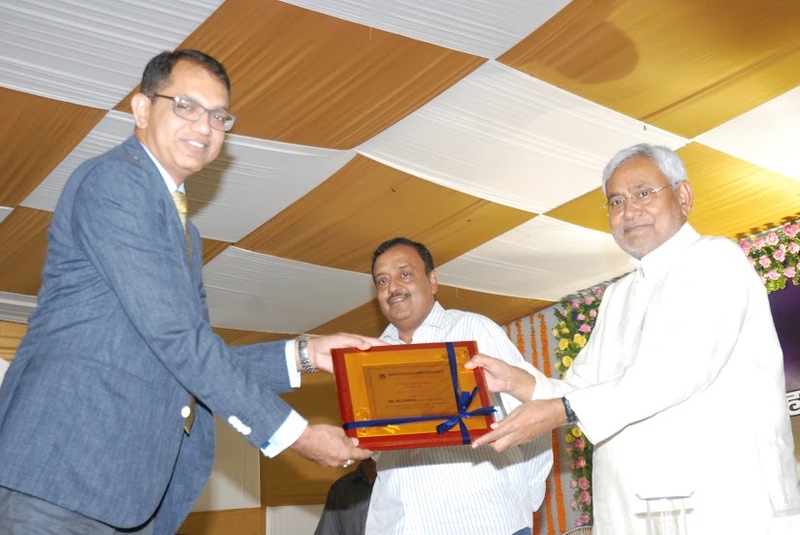 Our CMD, Mr. Raj Kumar has been honored with the award by the Hon’ble Chief Minister of Bihar, Shri Nitish Kumar at Patna (Bihar), on the occasion of 6th Foundation Day of Bihar State Road Development Corporation Limited (BSRDCL). Rodic Consultants Pvt. Ltd has been awarded with internationally acclaimed Integrated Management Systems (IMS) Certificates (ISO 9001:2008 Quality Management System, ISO 14001: 2004 Environmental Management System, and OHSAS 18001:2007 Occupational, Health and Safety Assessment Series) by RINA (an Italy based international standards certifying body).